Find the right drawing pad that suits you. Affordable graphics tablets for everyone, compatible with PC and Mac. Great focus on the high quality brand Huion that has drawing tablets in different price ranges. Whether you are a beginner and want to test a cheap graphics tablet like Huion H420 or prefer the extra features like the wireless Huion DWH69 you will find the right one from us. 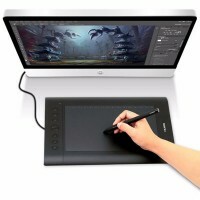 Now we have also received the latest products Huion Kamvas GT-191 and Huion GT 220 which has 8192 pressure sensitivity levels and FullHD resolution (1920x1080) that fits graphic designs or professionals! HUION H610 Pro drawing tablet 10x6.25"